Former Portadown defender Chris Ramsey breaks the deadlock at Shamrock Park during Larne's latest Championship win. In a tussle of two clubs with ambitions beyond the Bluefin Sport Championship, Portadown and Larne produced an entertaining exhibition of both steel and skill. The post-match talk centred on Larne’s path to full points built around the ugly side of the beautiful game towards establishing an 18-point lead at the head of the table. Portadown’s frustration at the final whistle centred on disappointment at the lack of reward for a performance that attracted plaudits without the points but signalled a platform towards future success over the promotion race run-in. Larne’s lead arrived off one goal born out of grit and another full of grace. 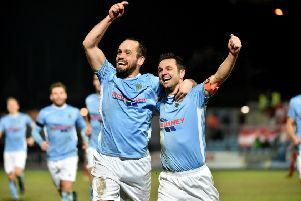 Chris Ramsey’s return to the Shamrock Park pitch he called home for six years in Ports colours featured a rare appearance on the scoresheet for the centre-back. His quick reactions inside the penalty area allowed Larne to break the deadlock off a corner-kick with a finish from a few yards. The second proved greater in both distance and delivery as David McDaid stepped up and steered a superb free-kick curling into the top corner. However, on an afternoon of flowing football, Portadown regrouped and responded to that second setback by surging forward over the closing stages. Adam Salley’s goal cut the gap within minutes of Larne’s 2-0 lead and set up a grandstand finale that called on Larne to remain resolute as the Ports went in search of a share of the spoils. “We knew coming into the game that, to get anything out of it, we would have to work for it,” said Larne boss Tiernan Lynch. “We had to work for what we got today but I’m absolutely delighted that we showed another side to our game by rolling up the sleeves and working our backsides off to get what we needed. “People often talk about how Larne are a lovely football side but maybe soft in the belly. “I think we showed today there’s no softness in the belly. “You could see our commitment, with people throwing their heads and bodies in to make those blocks. “That can be as pleasing to see as winning four or five and moving the ball around all over the place, so I was delighted with the team’s performance. Portadown now sit one point behind second-placed Carrick Rangers in the race for the pre-play-off promotion advantage. “The gameplan worked and the players did what we asked them to do,” said Tipton. “But two boys didn’t pick up off the set-piece and then the free-kick is world-class, he’s stuck it in the top corner. “It was tough with the pitch conditions heavy and they’ve a certain system that works for Larne but I think we negated it well. “Although disappointed in the result, I was pleased with what we did and how, so we go on and learn again. “The players now can follow a plan, it has taken us longer than we hoped and maybe some weeks earlier in the season when we asked something that didn’t work it was about belief. “Results do matter but they will come with performances like that and that standard going into other games should give us confidence. “I look all over the pitch and am happy with our players’ performance levels and communication.